One of the best things about traveling to a new place is the ability to bring back memories of the trip, whether they be in the form of photographs, home videos, mental images, trinkets or -- our personal favorite -- postcards. 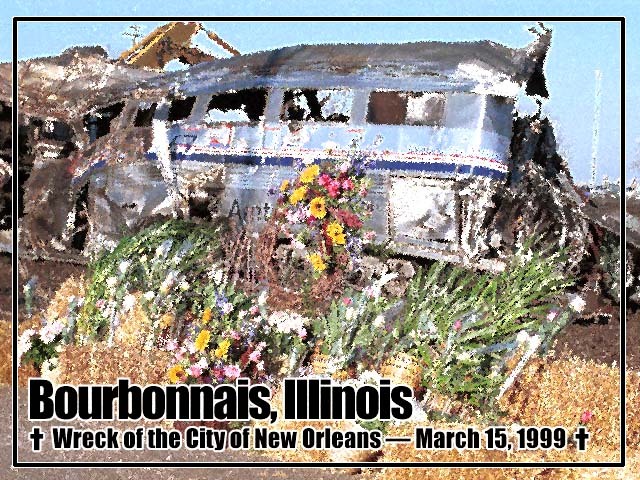 We've encountered many good gift shops in our dozens of railfan adventures, but even the best ones are woefully lacking when it comes to postcards of trains. We're not talking about the roster shots and action scenes of vintage locomotives that are usually found in train museums, good though that they usually are. We're referring to images with the name of a town or landmark emblazoned upon them in some way. For example, there aren't too many postcards of Hillyard or Dupont -- actually, none that we've seen. Wouldn't it be great if one existed? Well, thanks to the magic of Photoshop and our camera lens, these virtual greeters are now available for you to add to your personal railfan postcard collection. You can easily turn these into mailable postcards by simply printing them out on card stock on your color printer. Size them as you like, then share some great railroading moments with your friends. Browse our postcard rack below and see what we have in stock. Check back often to see what's new. 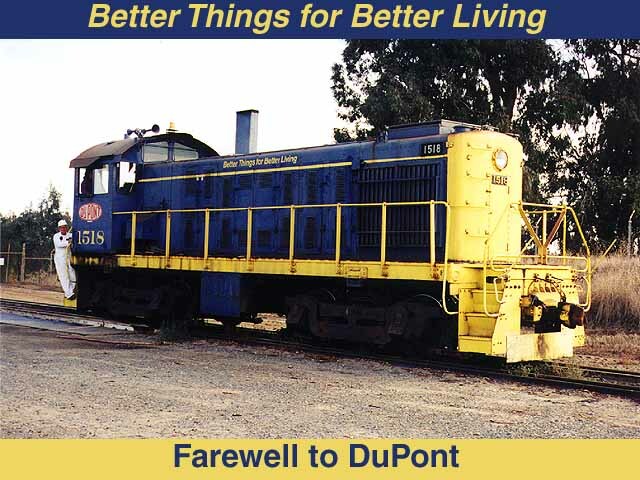 Dupont: "Better Things for Better Living/Farewell to Dupont" -- Commemorating the closure of the Dupont chemical refinery in Oakley. Photo by Glenn Gehlke. 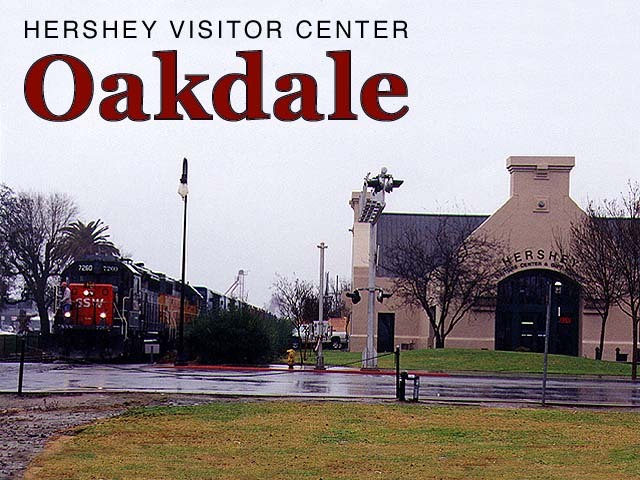 Oakdale: "Hershey Visitor Center" -- Where do you think the visitor center gets all its chocolate goodies? Not the railroad, but it sure is impressive when the UP runs the Oakdale local through town. Photo by Roni Gehlke. 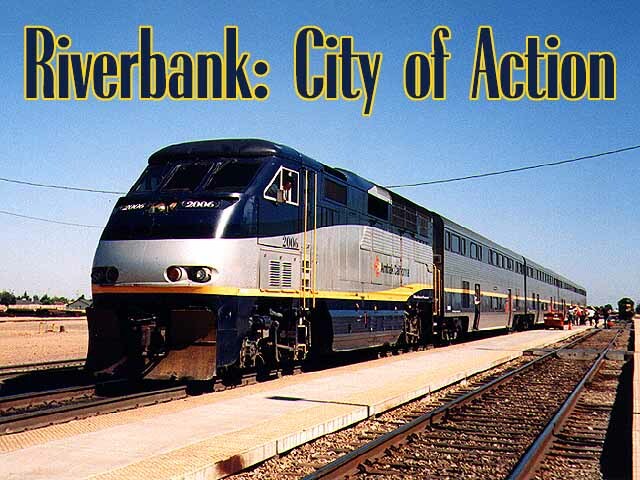 Riverbank: "City of Action" -- Amtrak San Joaquin Train 713 collects its passengers from the station at BNSF's Riverbank Yard. The hip slogan is Riverbank's, not ours. Photo by Roni Gehlke. 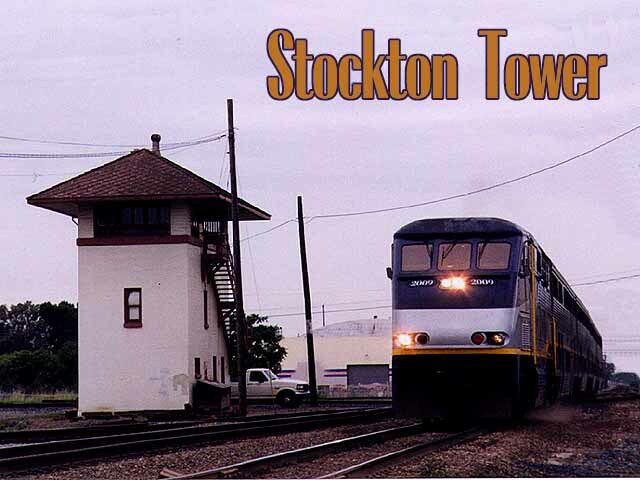 Stockton: "Stockton Tower" -- Train 714 strikes the pose as it passes the now-closed interlocking tower at the BNSF Stockton Sub's junction with the former Southern Pacific route. Photo by Roni Gehlke. 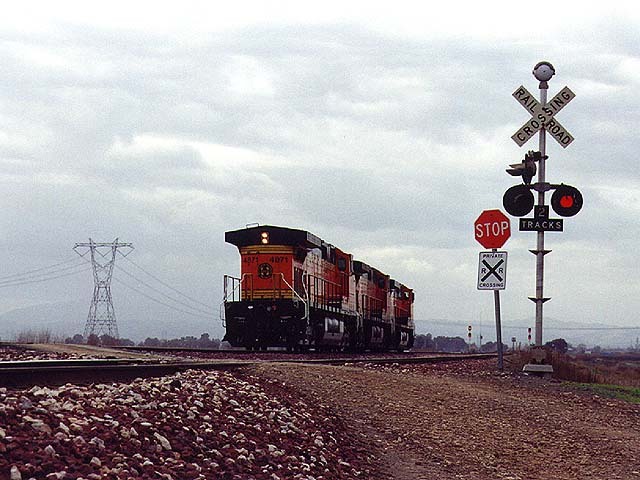 Oakley: "Milepost 1147.2" -- Only the most important location on the BNSF Stockton Subdivision. Our home page logo is available for your collection. Photo by Roni Gehlke. 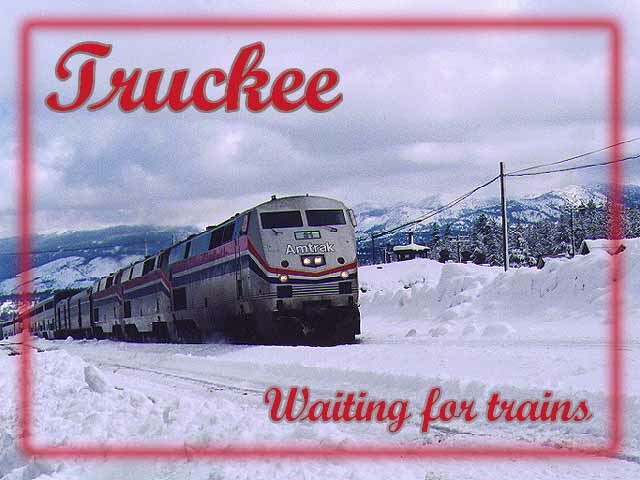 Truckee: "Waiting for trains" -- Amtrak's Train 5, the Zephyr, parts the snow of the high Sierra. Photo by Roni Gehlke. 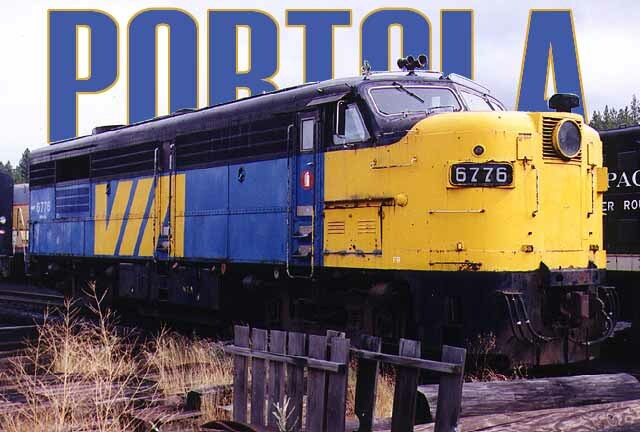 Portola: "Portola Railroad Museum" -- VIA Rail Canada's 6776 is among the equipment displays at this popular Railfan destination. Photo by Roni Gehlke. Martinez: "Southern Pacific/An afternoon in Martinez" -- SP 7609 is seen in this series of photos taken near the Martinez Amtrak station. Photos by Roni Gehlke. 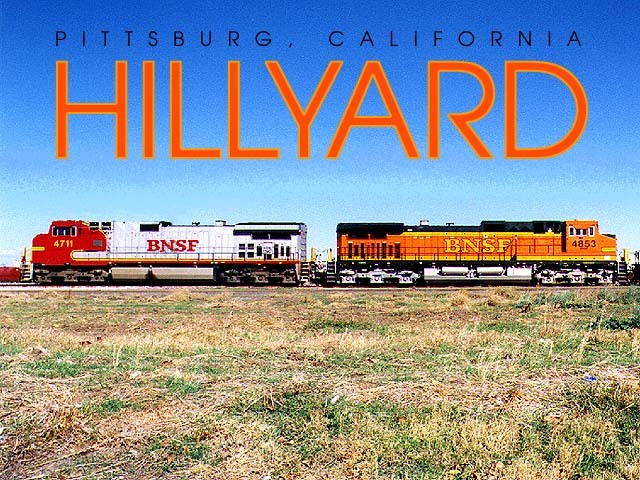 Pittsburg: "Hillyard" -- A pair of BNSF Dash-9s wait for work on the siding. Our digital artisans have removed the distracting line polls from BNSF 4711. Photo by Roni Gehlke. 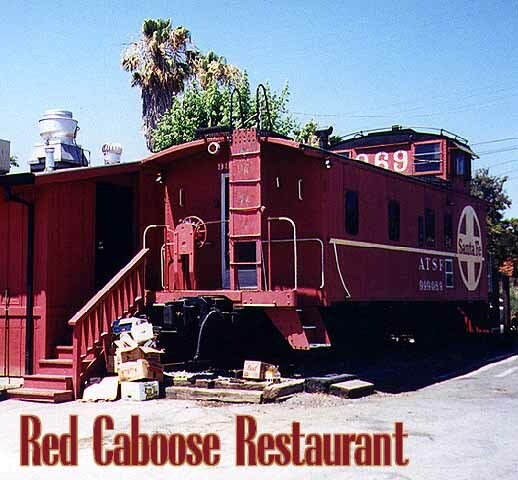 Antioch: "Red Caboose Restaurant" -- Where does a railfan go for beans in this town? The only place with a dining room carved out of the interior of an old Santa Fe caboose, naturally. Great calamari and linguica sandwiches, by the way. Photo by Roni Gehlke. 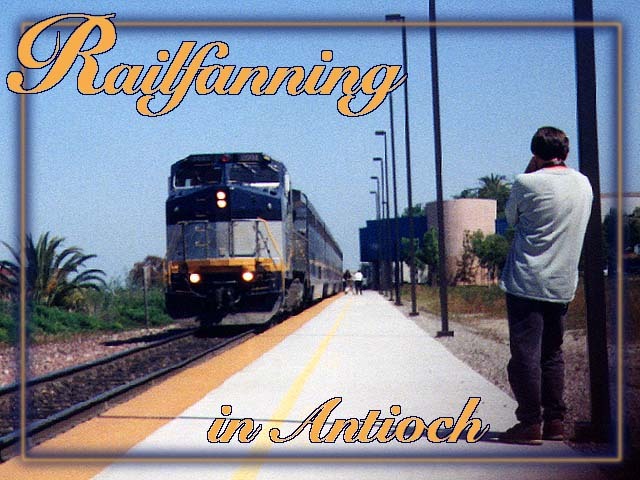 Antioch: "Railfanning in Antioch" -- That's the Antioch Amtrak platform, and that's Glenn leaning against the light post with the video camera. Photo by Benjamin Gehlke. 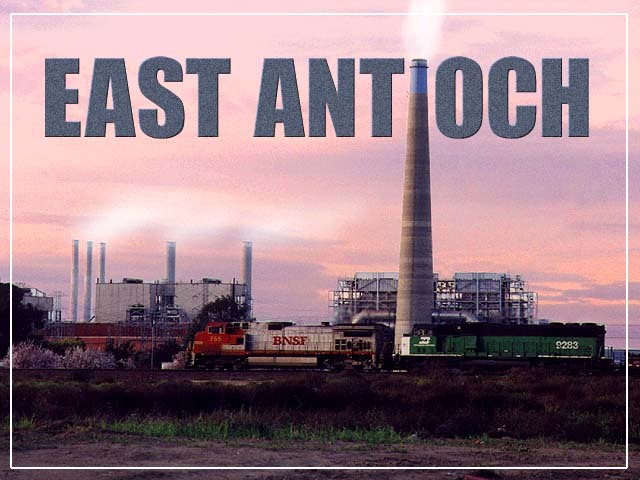 Antioch: "East Antioch" -- The massive exhaust stacks of the PG&E power plant and a spledid sunset combine to provide a picturesque backdrop for BNSF 755 and BN 9283. In typical postcard fashion we added some steam for effect. Photo by Roni Gehlke. 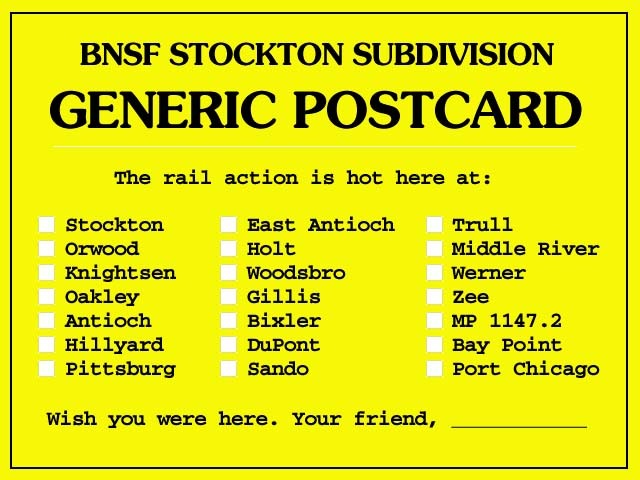 "BNSF Stockton Subdivision Generic Postcard" -- This one-size-fits-all card features 21 locations along the western end of the Stockton Sub with check boxes so the sender can mark all the places he or she has visited. Design by Glenn Gehlke. 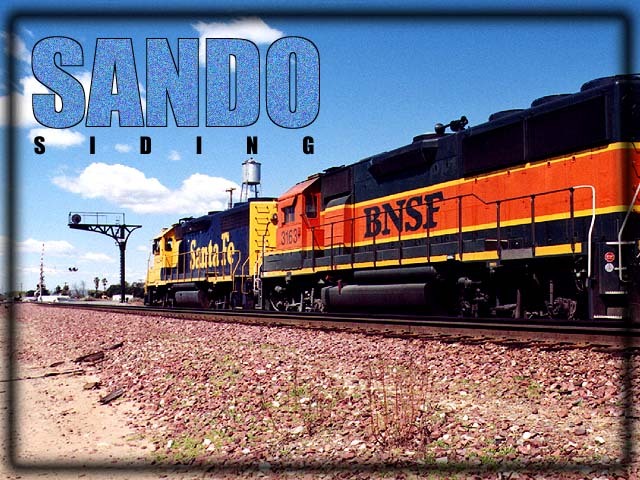 Antioch: "Sando Siding" -- The Pittsburg local waits for a green light at one of the former Santa Fe's classic cantilever-style signals. Photo by Roni Gehlke. 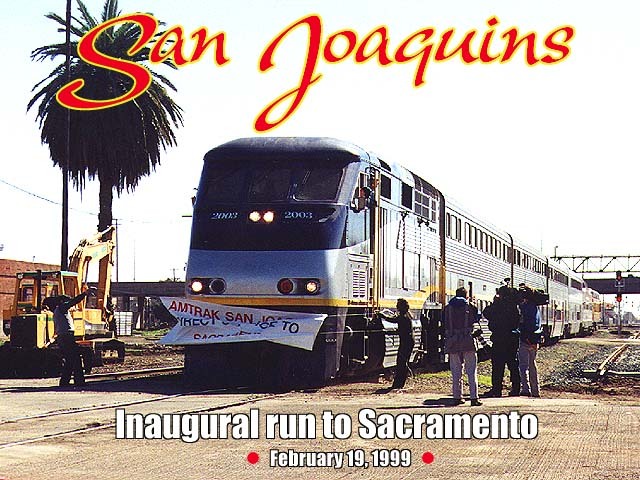 Stockton: "San Joaquins -- Inaugural run to Sacramento" -- Commemorates the first day of through-service from Bakersfield to Sacramento on Amtrak's San Joaquin line. Photo by Roni Gehlke. 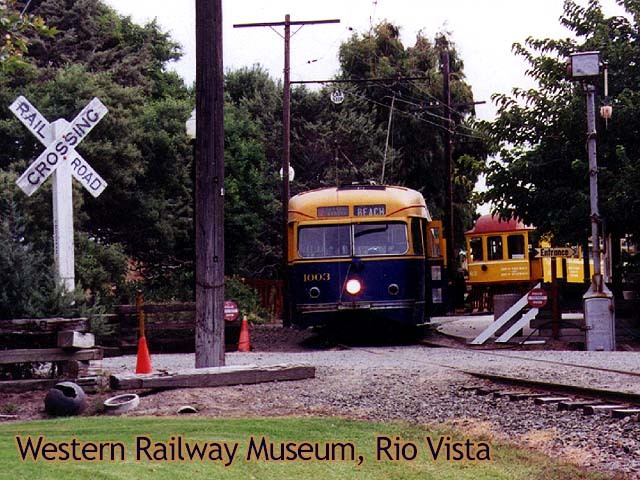 Rio Vista: "Western Railway Museum" -- A view of two of the interurbans visitors can ride at this popular Bay Area attraction. Photo by Roni Gehlke.